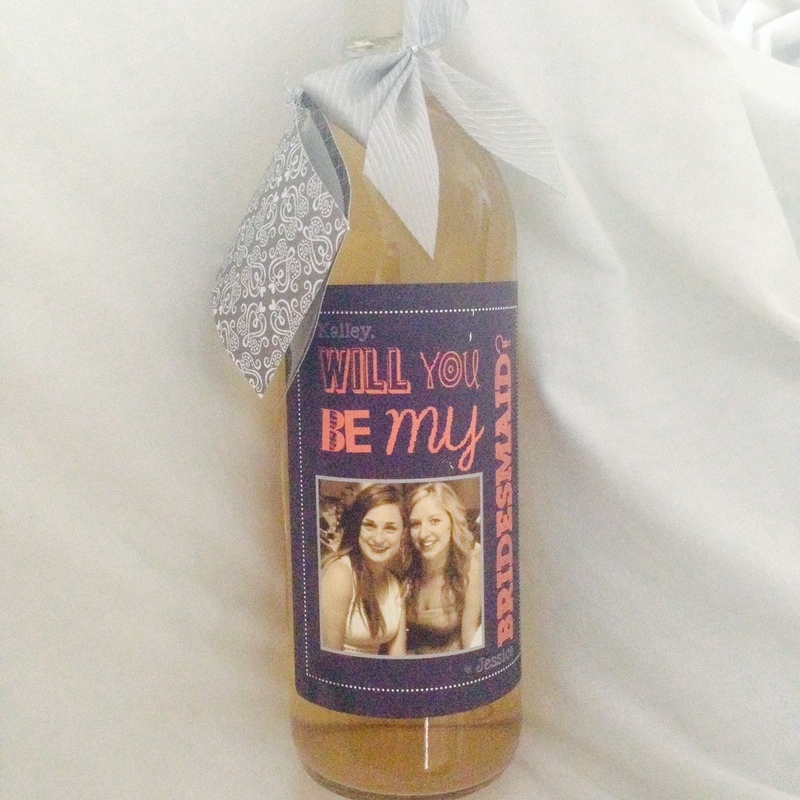 “Will You Be My Bridesmaid?” – Woo Your Girls With Wine! 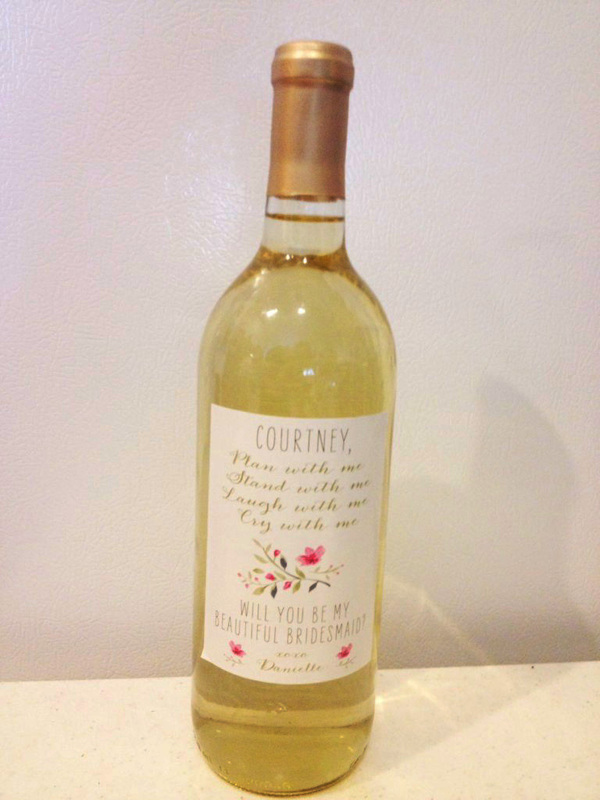 What better way to ask your BFF, sister, or cousin to be your bridesmaid than with a poem and a bottle of wine? It’s like you’re wooing them, the way your soon-to-be-husband wooed you! I recently learned about these thoughtful and different gifts, and had to share the love! Two of my friends, Courtney and Kailey have both recently been asked to be bridesmaids. Courtney is going to be in her friend Danielle’s wedding, and Kailey is supporting her brother Evan, and soon-to-be-sister in law Jessica! Kailey received her bottle right before my Mom headed up to Canada for a visit with Kailey’s mom Rena. Jessica and Evan gave out their wedding party invitations at their engagement party, and all of Jessica’s bridesmaid’s wine bottles doubled as centerpieces for their tables! My Mom couldn’t wait to tell me all about these different and delectable invites, and of course Kailey absolutely adored it too! She got them from an awesome Etsy shop called Vintage Lee Crafted, which you can check out HERE! The personalized labels came with a special photo on each bottle, as well as the bride-to-be popping the big question: Kailey: Will You Be My Bridesmaid? You can view the entire Etsy shop HERE! And check out all that they have to offer for the special ladies to take part on your special day! The labels are about $36-45 for 6 labels depending on which design you chose, and they come with instructions for removing the actual wine labels, and applying the new! For the bridesmaid that doesn’t drink you could include a bottle of FRE non-alcohol wine (more info on FRE HERE), or for the younger bridesmaids you can even include the Welch’s Grape Juice bottles shaped like wine. 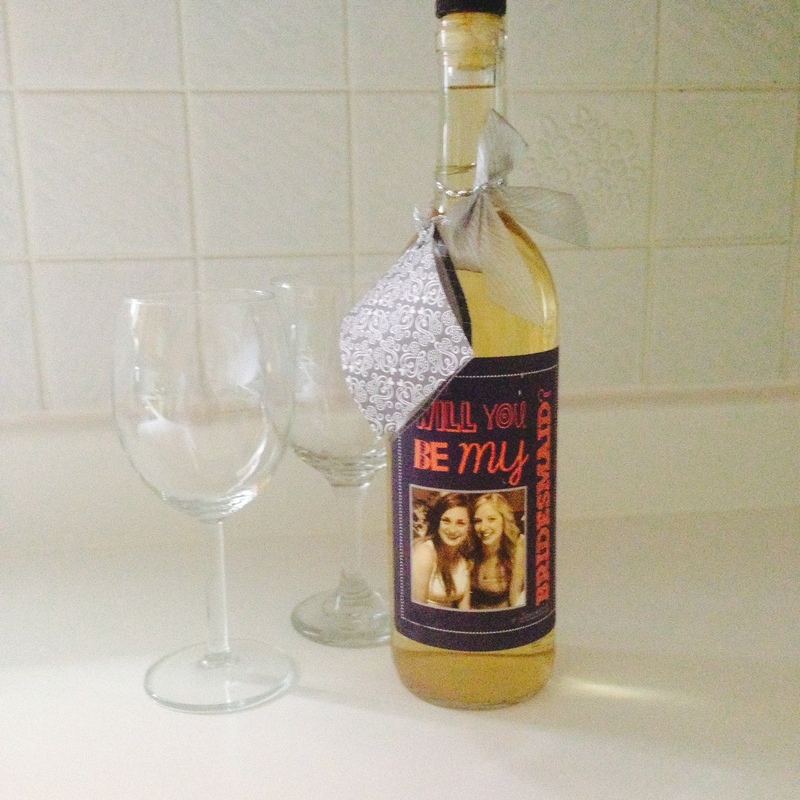 I’m not a wine-drinker….but I seriously can’t wait for one of MY friends to get married, just in case I get this great gift! Thank you for sharing these wine-tastic ideas with us, and Happy Wedding Season, Ladies!!! The Man Cave: Back To Future! Take Your Child to Work Day, Then and Now! Part Two: Waste Not, Want Not – A Week of No-Shop, Quick Comfort Meals! Waste Not, Want Not: A Week of No Shop Quick Comfort Meals…Part One! Keep Your Money-Saving Resolutions by Packing Up Christmas and Picking Up Post-Holiday Bargains! 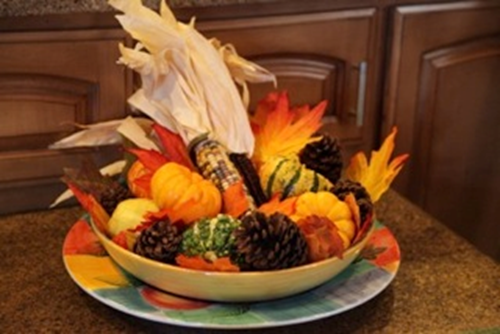 Repurpose Christmas Into New Years with a Low-to-No-Cost Celebration!